Something Neat XXIII: So What is Jones Up To? 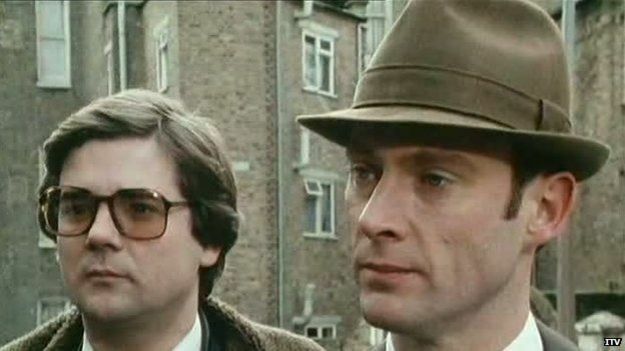 Meic Povey played DC “Taff” Jones alongside Patrick Malahide’s DS Chisholm in eighteen Minder episodes. He only appeared in three post-Chisholm episodes before leaving the series to pursue other interests. BBC Wales has a Welsh language article on his post-Minder career as a successful playwright. He has just had his first commission for BBC Radio Wales. Here is the Google Translated version. He speaks fondly of Minder, saying how proud he is of his association with a program which boasted 18 million viewers. He also says that English was actually a second language to him as he’s more comfortable speaking in Welsh. Chisholm & Jones: Best team ever. This entry was posted in Minder, Something Neat We've Found and tagged BBC, BBC Radio Wales, DC Jones, DS Chisholm, ITV, Meic Povey, Minder, Patrick Malahide. Bookmark the permalink.